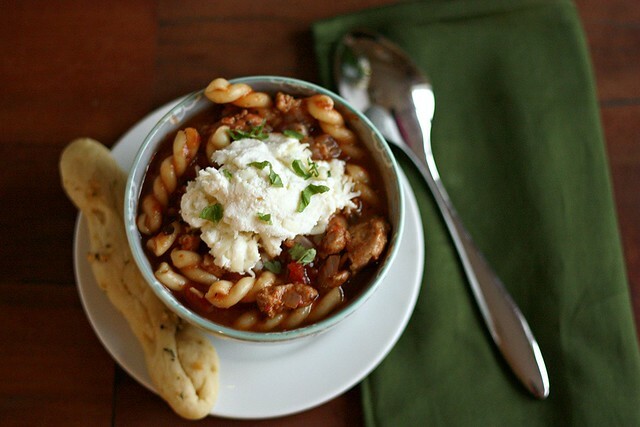 Lasagna Soup – Elly Says Opa! 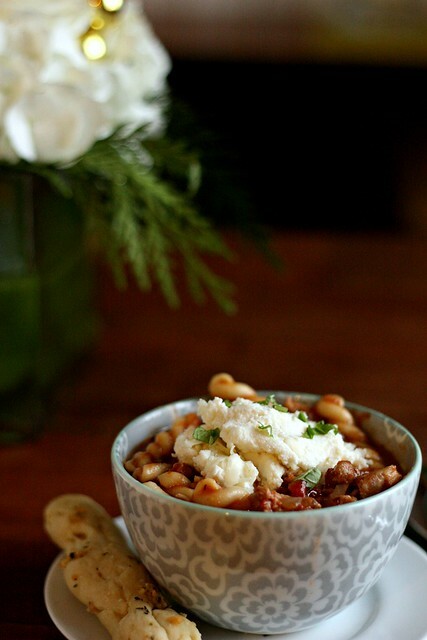 This soup has definitely made its way around the blogosphere (and Pinterest). I debated posting it, assuming you’ve already seen it, but we really loved this soup so I not only wanted to share it with you in case you hadn’t seen it, but also make sure it’s in my archives, so I remember to make it again! This soup is precisely what it purports to be—lasagna in soup form. The base is made with Italian sausage, herbs, tomatoes, and pasta. Then you put a dollop (okay, maybe like 3 dollops) of a ricotta-parm-mozzarella mixture in each bowl to make this truly lasagna-y (<—very technical culinary term). The soup is both flavorful and hearty, and is easy and pretty quick to make, too. Heat the olive oil in a large Dutch oven or stockpot over medium heat. Add sausage, crumbling as you stir, and brown (about 3-5 minutes). Add onions and cook until softened. Stir in garlic, oregano, red pepper flakes, and tomato paste. Cook for about 2-3 minutes or until fragrant and the tomato paste starts to turn a little brown. Add the diced tomatoes, bay leaves, chicken broth and beef broth; stir to combine. Bring to a boil and then reduce heat and simmer, uncovered, for 20-30 minutes. Add the pasta and cook until al dente. (Alternatively, you can reduce the amount of broth by a little, and cook the noodles separately, adding them to individual bowls before serving.) Season the soup to taste with salt and pepper. Remove from the heat and stir in the basil. While the pasta is cooking, combine the ricotta, Parmesan, mozzarella, and pepper in a medium bowl. To serve, place a large dollop of the cheese mixture in each soup bowl, and ladle the hot soup over the cheese mixture.